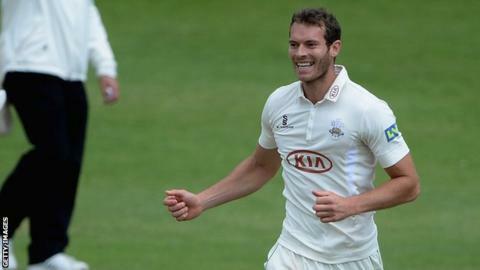 Surrey are on course for victory after three wickets from Chris Tremlett helped dismiss Leicestershire for 271 and forced them to follow on. Resuming on 125-3, Matt Dunn (2-96) removed Dan Redfern (25) in the first over of the day at the Oval. A 59-run partnership between Niall O'Brien (33) and Ben Raine (27) was the second largest of the innings. The visitors finished the day on 141-2, still trailing by 110 runs, after opener Angus Robson made 81. "A noisy, almost frenetic first half of the day at The Oval saw Leicestershire lose the last seven wickets of their first innings for 146 runs, but a different, altogether calmer atmosphere prevailed after they were asked to follow on, and the Foxes responded, giving themselves renewed hope they can at least save this game. "Angus Robson again played beautifully in going to 81, and there was almost a sense of disbelief that yet again he should have failed to go on and score a first first-class century, edging the ball into his pad and up into the hands of short-leg. "What will help them is an unfortunate injury suffered by Jade Dernbach, the Surrey seamer collapsing with what looked to be a serious hamstring problem shortly before the close of Leicestershire's first innings. "Spinners Gareth Batty and Zafar Ansari are likely to have a bowl a lot of overs to prise the visitors out for a second time on what is still a very flat track, though one or two deliveries are starting to turn. An interesting final day is in prospect."